The seventh round of the Northern Region Explore Series 2018 was held at Hexham on 2 September in beautiful conditions. A small but very keen entry took part in the penultimate event of the series. It was another Sweep Splash and Dash competition, so one or two struggled with the big oars! Tynemouth Buoys (TYN) with 8 points (4 wins from 4 races) were winners of the round in the the open competition, with Hexpletives (HEX) and Dan's T-shirt (TYN) - the latter on their first outing in the competition - sharing second place with 7 points (3 wins each). In the women’s competition Tyne of your Life (TYN) with 6 points (3 wins from 3 races) won the round in the women's competition. In the overall standings after Round 7 Barcing Mad (BER) still lead the open league by 5 points from Tynemouth Buoys who overtake Wreckless (TEE) to move into second place. Tyne of your Life gained a point on TURC Ducks (TYU); the latter now only have a one point lead over the former in the women's league with one round remaining! The results from this event can be viewed below and the resulting up-to-date league table is here as a pdf. 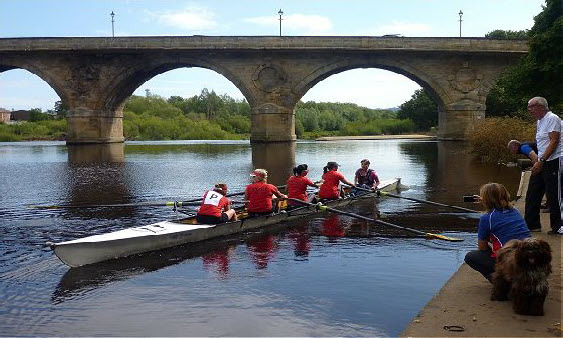 The next and last round is a Sculling Splash and Dash event at Tyne ARC on Sunday 7 October. There will be presentation and celebration after the racing (and food and drink all afternoon), so please do come, even if only to watch. Racing will be from 12 noon till about 3.00pm. The results matrix is below - click on image for larger jpg or here for a pdf.